When Thomas Jefferson sent Lewis and Clark northwest and Zebulon Pike south to survey the Louisiana Purchase, he could have never dreamed of the sights that lay in wait for these intrepid explorers. Nor could anyone have imagined the distances involved. Leaving Missouri in the summer of 1806, leaving in summer garb for a roundtrip anticipated to take six months, Pike and his men had no notion that by Christmas they would be cold, starving, sockless, and plowing through waist-deep snow near present day Salida. The men suffered greatly. Two were left behind In Canon City. Two additional men were left behind just south of Westcliffe, and a fifth man was left just east of Medano Pass. Noting a “small blue cloud” in his journal, Pike watched the cloud take on mass as he neared Pueblo, and on November 23 he headed north to see the mountain for himself. Pike had every intention of climbing to the summit, but the weather was not in his favor. 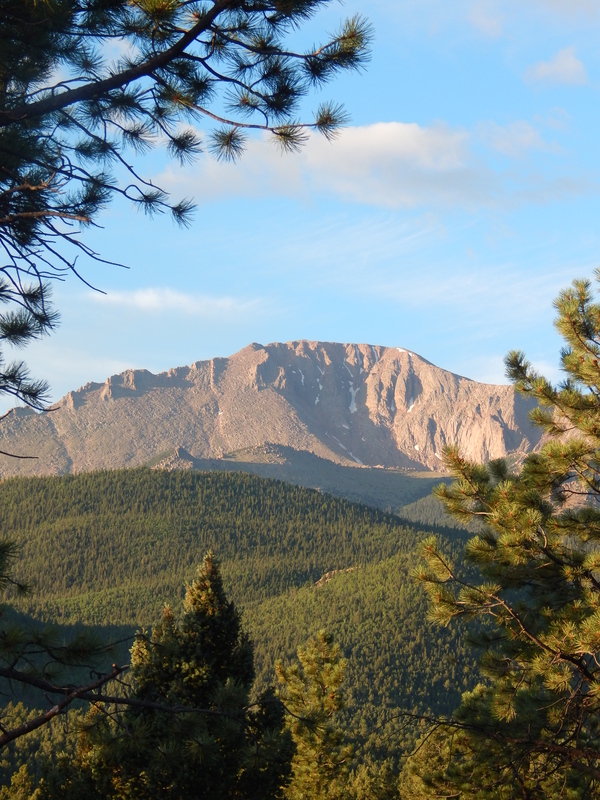 Pikes Peak is taller and steeper than Pike thought. It is bigger than I thought! 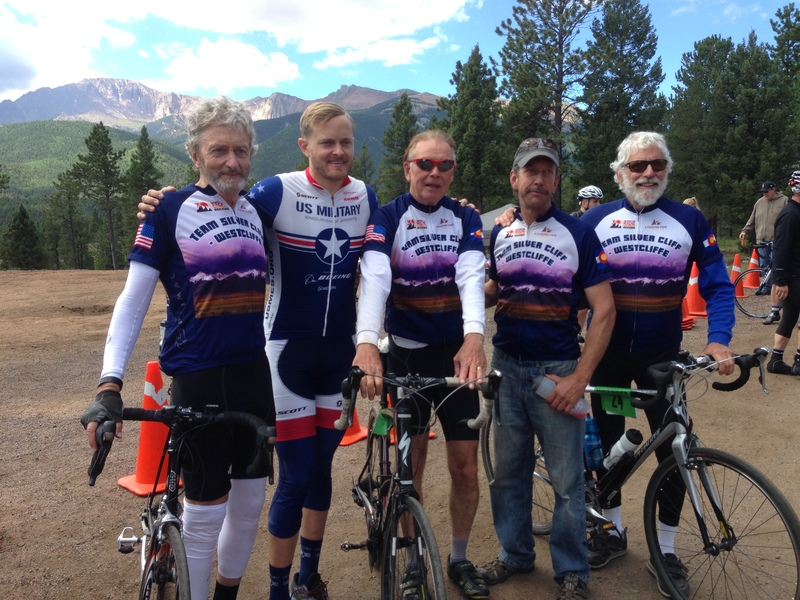 Sunday, August 9th, three founding members of the Silver Cliff/Westcliffe Ride the Rockies team, in the company of Kyle Pitman and Jim Remington, churned and burned their way up the mountain as participants in The Broadmoor Pikes Peak Cycling Hill Climb. Kyle rides for U.S. Military Endurance Sport. http://www.usmes.org . And Remington climbed last year as well as this year. Once was not enough! 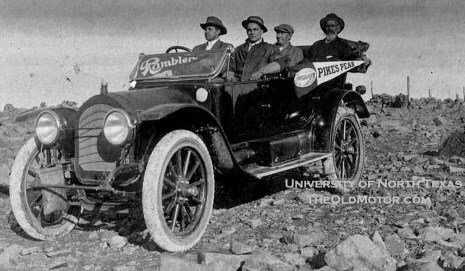 1913 – An early Rambler hill climbs to Pikes Peak. 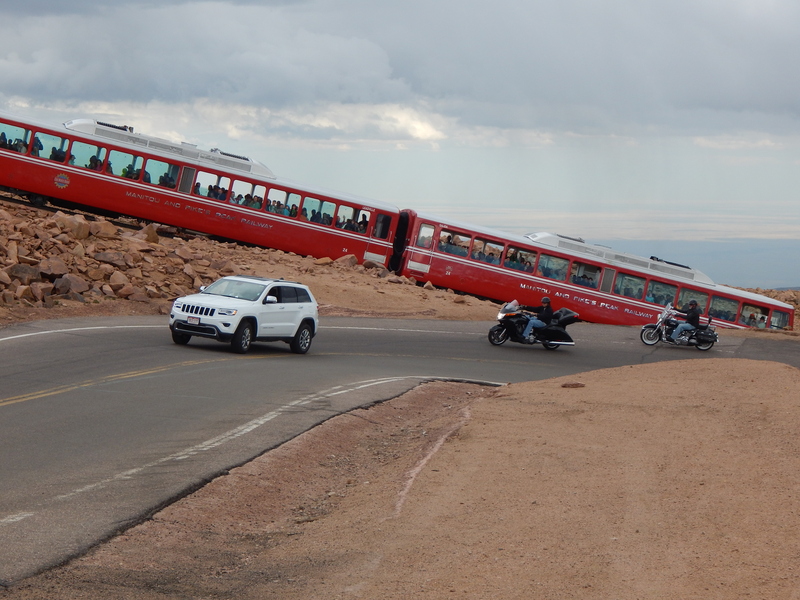 Having never driven the 19-mile Pikes Peak Highway (paved in its entirety in 2011) I thought that it might be a good idea to drive to the summit prior to Sunday’s ride. Yes, we had a topographical map, but a piece of paper doesn’t bring the ups and downs – home to the bones. Mark drove; I sat in the passenger seat taking notes to correspond to the mile markers. 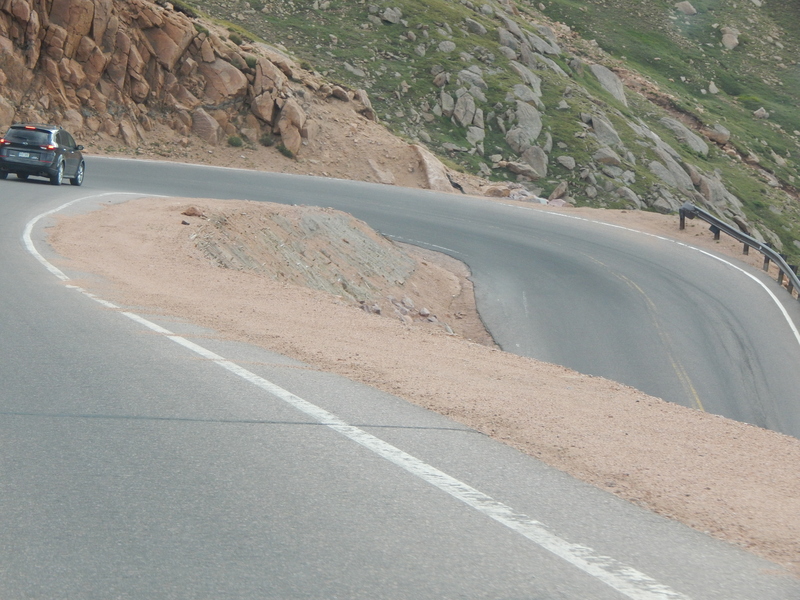 Hairpin curves and the absence of adequate guardrails keep drivers on their toes. If you think about it, Zeb Pike’s projection that he could hack his way through the forest, reach the summit, and return within three days was probably over-reach. That said, where would we be without men of vision? I recommend your reading Zebulon Pike’s journal of his trip. It is a fascinating first-hand account of the landscape and the men who braved the unknown to know it. This entry was posted in Lousiana Purchase, U.S. Military Endurance Sports and tagged " Westcliffe CO, Pikes Peak Highway, Silver Cliff CO, Silver Cliff/Westcliffe Cycling Team, The Broadmoor Pikes Peak Cycling Hill Climb, Thomas Jefferson, Zebulon Pike. Bookmark the permalink. * As you say: “ The Map Is Not The Territory…… “. I did not like really being an Officer in the US Navy because it was not like books and movies I enjoyed. I like “The map is not the territory,” and your personal example, Arthur, is perfect! I should think of some examples that apply to me. Missed your company, Brent. You missed the best part. Mark misplaced his helmet and did not realize it until moments before the start. No helmet; no start. So he ran through the parking lot calling out for a spare helmet. He was given one… by a girl! It didn’t really fit – way too small. About 13,500 feet, Mark had a severe headache. He thought it was probably elevation sickness. But when he took the helmet off and saw the serious indentations on his forehead, he thought again. The headache may have been the helmet. A little laughter is helpful on these challenging rides. Doris, this might have been the most entertaining of all your blogs to-date!! Just loved it! I know that you bike. Lori Fox is thinking about rounding out the team with more female riders. She will start slow… Westcliffe to Silver Cliff… (it is uphill and a bit of a challenge for me) and as the women gain strength, she will lengthen the training rides. I think that you want to participate. I’ll keep you posted, Robyn. Spent 10 mins typing in my comment on iPhone & just lost sodding thing !!! Yes I get the pull of the mountain roads & tho have trouble cycling the modest hills of Crouch End I still want to do the Tour de France route near our house in Pyrenees which is less arduous than Pikes Peak looks – one day 🙂 in the meantime will admire those who actually get up & do such things. One question – where are the women in the team? No, Jennie, you did not lose your first comment. I received the first and second. As for climbing Crouch End hill – a major goal – can’t imagine my cycling up it. As for the Westcliffe team, Lori Fox rides with/for the team and she is one of the strongest riders. It is a great thing to see her at the head of the pack. The men are impressed with her performance and proud to have her. Looking ahead, Lori is looking for more women to join her. Thanks for reading.